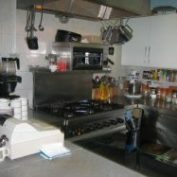 There are 2 main areas currently available for hire at Columcille: Our Hall and the Cafe/Kitchen. Hiring out the venue provides valued income for our day services as well as providing a venue to community groups and others. 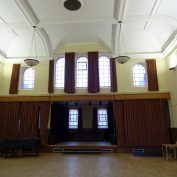 The HALL is a large, bright and welcoming space for both day time and evening events. 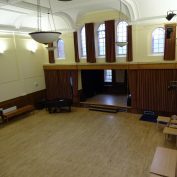 The location and capacity of the venue makes it excellent for choirs, workshops, dance and exercise classes, craft markets, ceilidhs etc. Regards events with music, please note that as we are in a residential area, noise levels are restricted. The size of the hall is approximately 12m x 12m. It has a recently refinished hardwood floor and a stage area. There is seating for up to 100 people. There is also a balcony area seating up to 40 people – which can be available upon request. 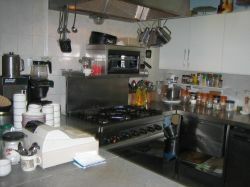 The CAFE & KITCHEN area is a separate space ajoining the hall area. 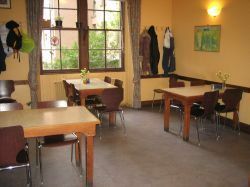 It is a fairly unique space in terms of Edinburgh hall hire in that it offers a catering kitchen (you may self cater or bring in caterers) and an area with seats/tables for up to 20 people. 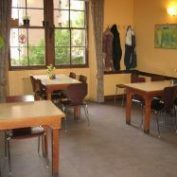 It is possible to hire the hall only at certain times or hall & cafe together. Weekend evening rate – hourly rate as above after 5 pm. Registered charity rates by negotiation. If you’d like to make an enquiry or arrange to view the facilities please contact Grace on 0131 447 7404 (Thursday/Fridays only for phone contact), or e mail: [email protected] or complete the contact form. Please click here to read the terms and conditions of hiring the Columcille hall and cafe.